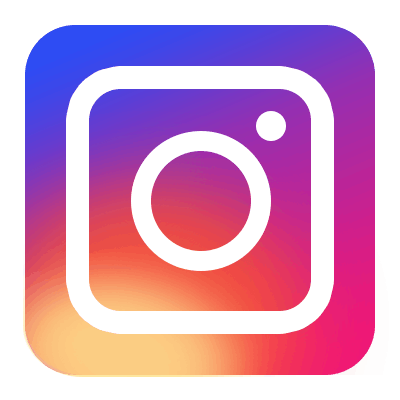 For meeting more our customers' demand, to catch up the latest trends and design in mosaic tiles. Here Bluwhale Tile brings and introduces our new-design ceramic mosaic tile to you all, which will help you bring your dreamy space into reality! So, let's go! 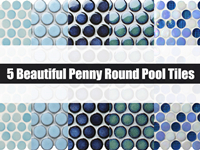 Penny round mosaic tiles nowadays are a staple of swimming pools, today we are sharing you 5 beautiful penny round pool tiles at Bluwhale Tile, they are affordable and classy. Bluwhale Tiles creates a new collection of triangle tiles in geometric patterns, today we are sharing 6 interesting geometric tiles which can add a sense of dynamism to any swimming pools. 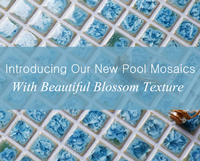 Take a closer look at our new collection of fambe ceramic mosaic pool tiles features blossom textures in glossy finish. 4 popular colors to choose from, read on for more details to get design inspiration for your next swimming pool project. Swimming is one of the most popular sports as well as recreations done by many people today for the purpose of staying healthy. Also, swimming pool is considered a splendid establishment that can add pragmatic and aesthetic value to your property, so it is important to ensure that the material used for pool construction is long lasting and has a beautiful appearance. 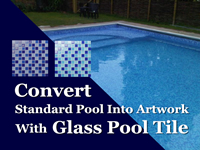 Compared with other pool finishes, glass mosaic pool tiles are more attractive and cost effective. 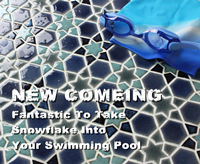 In the following BluwhaleTile is about to show you four new pool mosaic glass tile designs. 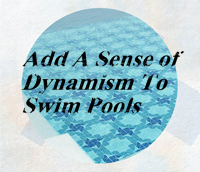 You will find some feasible solutions for your pool improvement.